You'll need to purchase the items under the "Items Needed" section before starting. I have included ready to cut Carbide Create and Vectric V-Carve/Aspire files depending on the program you use, as well as SVG files if neither of those work for you. All items referenced are included in the files you purchase. Be sure to check all toolpaths and settings before running any of these files to make sure your bits match up and change where necessary. Carbide Motion hit Rapid Position, then "C" to take you there. Run "Initial Hole pattern" file insert T-Nuts and flip over into same positon before proceeding. Screw a new 32x32 piece of 3/4" MDF to the top of the wasteboard in the center of the cutting area, mark with the sides with a pencil, and proceed to the second file. 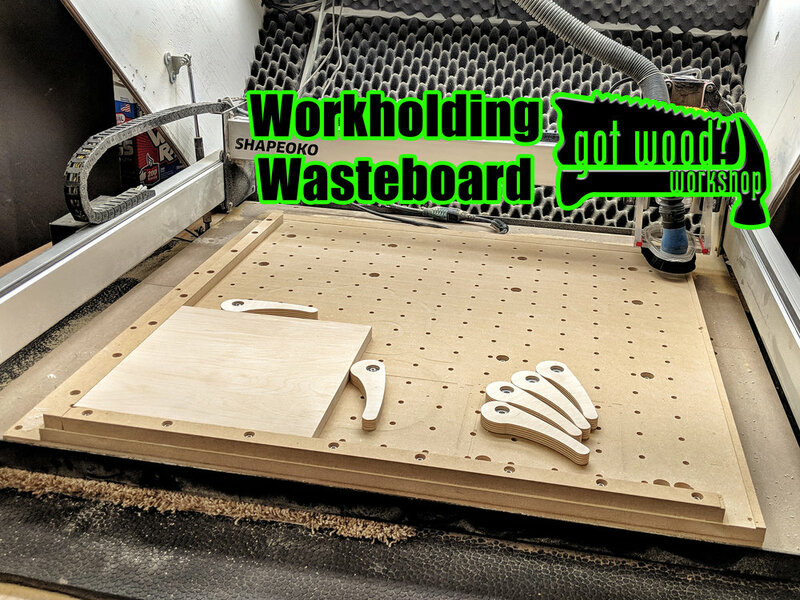 This gives you a removable supplimentary wasteboard with screw holes that won't wear out and a second supplimentary wasteboard if you need to do something larger than the new wasteboard you're creating. Option 2 - Cut a piece of 3/4" MDF to 33x33 and screw it to the stock wasteboard (position it as far forward as possible against rail and draw lines on each side to mark position) in center of cutting area, if using Carbide Motion hit Rapid Position, then "C" for Center to take you there. Start with "2 - Underside of Wasteboard" file. After "2 - 31X31 - Underside of Wasteboard" has run, install all T-Nuts and flip the wasteboard over in the same spot you previously marked out. If you chose Option 1, run the "3- 31x31 - Topside Bolt Hole Pattern" file using the same X, Y, and Z zero positions and bolt wasteboard down after the file has completed running. **If you chose Option 2, this step is not needed. Run "4- 31x31 - Flatten Wasteboard - Optional" file if you would like to flatten the wasteboard, not required, but recommended. Attach 2" x 3/4" MDF strips to front left corner of wasteboard making a right angle. You can use brad nails or screws, be sure to place them where holes won't be drilled. Using the same zero settings from the previous fence file, run "6- 31x31 - Fence Facing" file. After this the wasteboard is complete. Once the clamps are cut out install a washer and bolt and your new wasteboard is ready to use! If you have any questions, comments or concerns please let me know and I will do my best to address them!